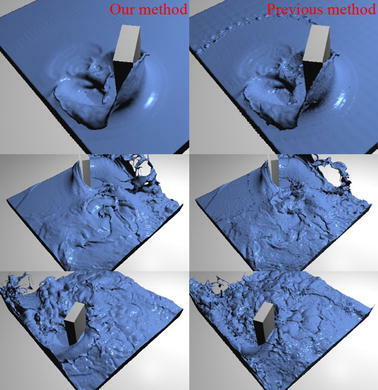 We present a new method for adaptively extracting flicker-free surfaces from time-varying nonuniform point-set data such as a hybrid particle–grid water simulation. When particles are irregularly distributed in hybrid simulations, degenerate triangles and holes may occur when constructing surfaces adaptively. These abnormal surfaces appear unexpectedly between frames, and we call them “flicker” artifacts (see Fig. 1). 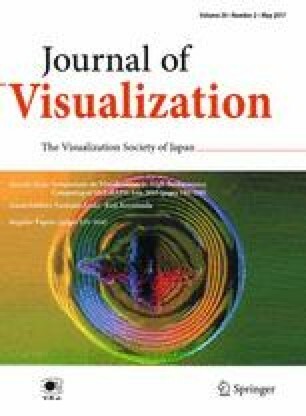 In this paper, we address this problem by developing: (1) a kernel-based octree technique to avoid degenerate triangles being created because of size discontinuities between adjacent leaf cells; (2) a level-set error compensation algorithm to avoid apertured water surfaces caused by some particles being lost in the triangulation process; and (3) the extraction of sufficient surface particles for efficient reconstruction of surfaces with extreme amounts of spatial adaptivity. Comparisons with previous methods convincingly demonstrate that our technique successfully reduced flicker artifacts. This research was supported by a Korea University Grant and Hallym University Research Fund (HRF-201609-008), Basic Science Research Program through the National Research Foundation of Korea (NRF) funded by the Ministry of Education, Science and Technology (NRF-2013R1A1A2011602). This research was supported by Basic Science Research Program through the National Research Foundation of Korea (NRF) funded by the Ministry of Education, Science, ICT and future Planning(NRF-2014R1A2A2A01007143, NRF-2015R1C1A2A01053543, NRF- 2015R1A2A1A16074940, NRF-2015R1A1A1A05001196).